Mornings come early for media personality Stephanie Kralevich, host of MORE Good Day Oregon. She rises in the dark while her family is asleep, hunts through her messy master closet for the day’s on-air outfit, and drives to the studio, powered by coffee and love of her work. There is literally no ceiling light in her closet. She has to use a flashlight to navigate! No wonder Steph’s master closet is a daily rub for her. 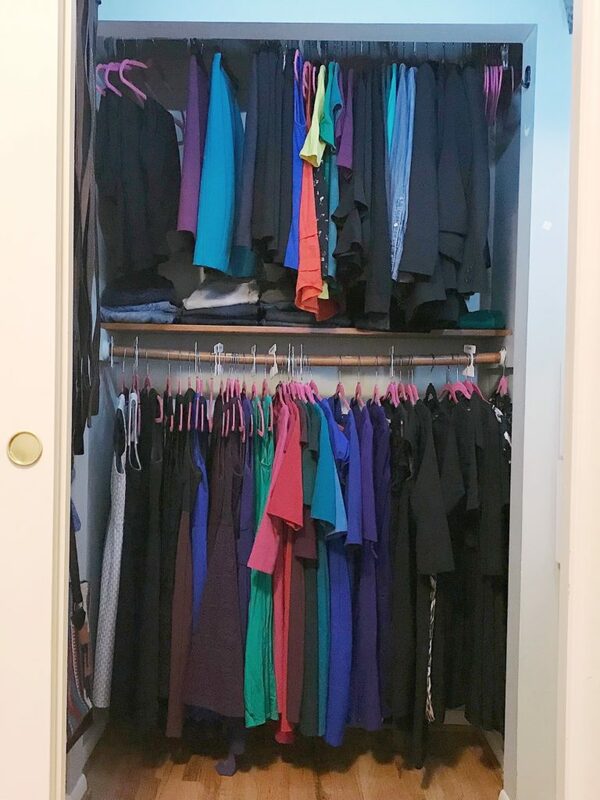 She is not alone – hers are universal closet struggles, and the antidote is a TOTAL OVERHAUL. 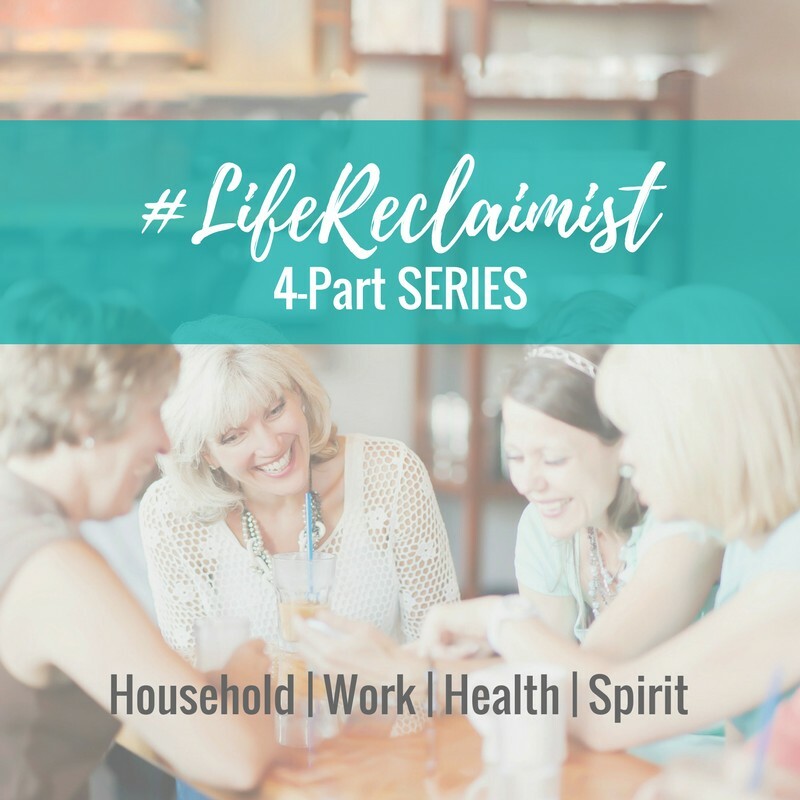 Since Steph introduces my segments as MORE’s Organizing Expert, she has often commented about her rag-tag closet and systemic disorganization. I thought it was high time to resolve Steph’s closet clutter and ease her morning routine. 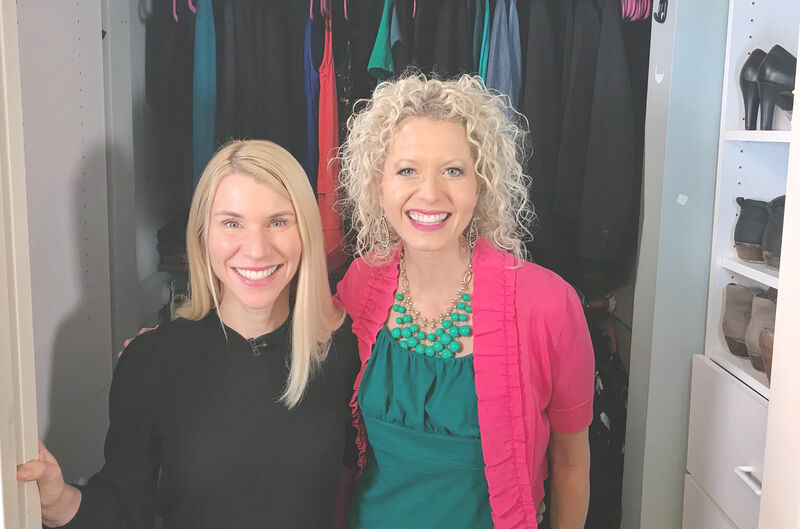 I wanted to help Steph reclaim her master closet! 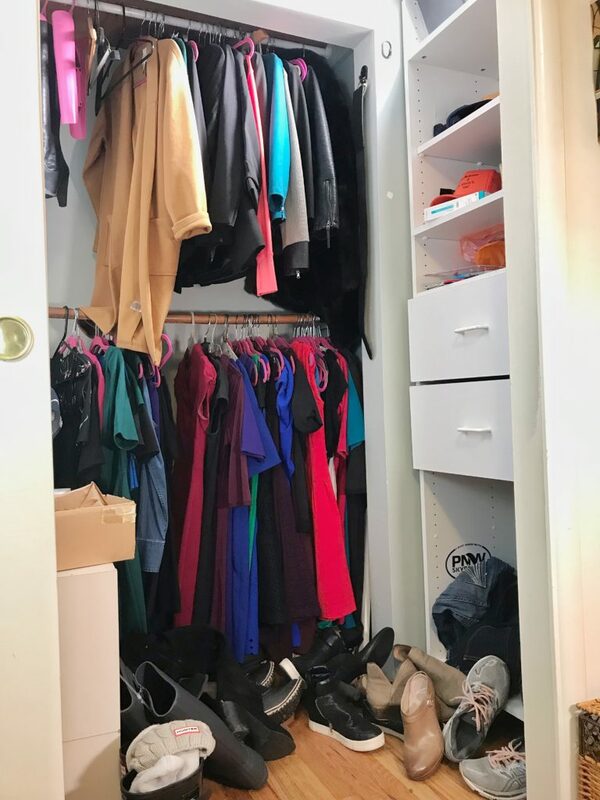 When you begin to tackle your own master closet, these handy tools will help you during the emptying and sorting phase. The rolling racks make it easy to remove clothes-on-hangars without having to lay them on a bed or surface. Nesting laundry baskets make great, large sorting receptacles for things like tall boots, big shoes, belts, etc. Banker’s boxes are perfect for sorting smaller items like lingerie, scarves, and jewelry. Garment separators are implemented (and labeled!) AFTER all clothes are sorted by type and reloaded on clothes bars. I started her project the same way I start every organizing project – by clearing out the space so we can get down to the infrastructure. If you don’t empty the space-to-be-organized, all you can do is shuffle stuff from here to there. Emptying a space allows you to organize-by-type as you go, and assess your inventory. When organizing a space – completely clear it out. Emptying a space allows you to organize-by-type as you go, and assess your inventory. Good organizing requires detective work. 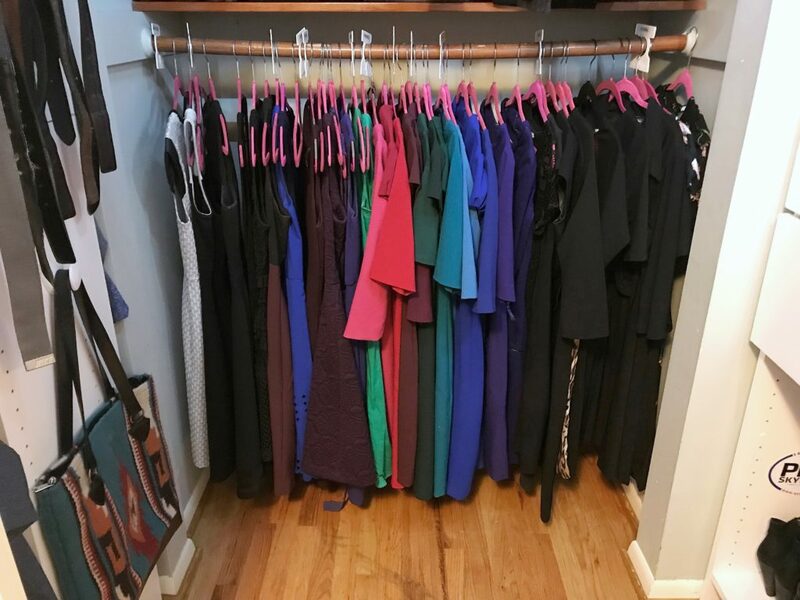 Often, our closets become a “final frontier” for stuff about which we can’t make a decision, so those items end up in our closet purgatory. When you identify and remove unrelated items from a space, pause and note what ORGANIZING SYSTEMS you’re missing that has caused these items to be nomadic in the first place. Stephanie was great about letting go of most of the knick knacks and old paperwork. 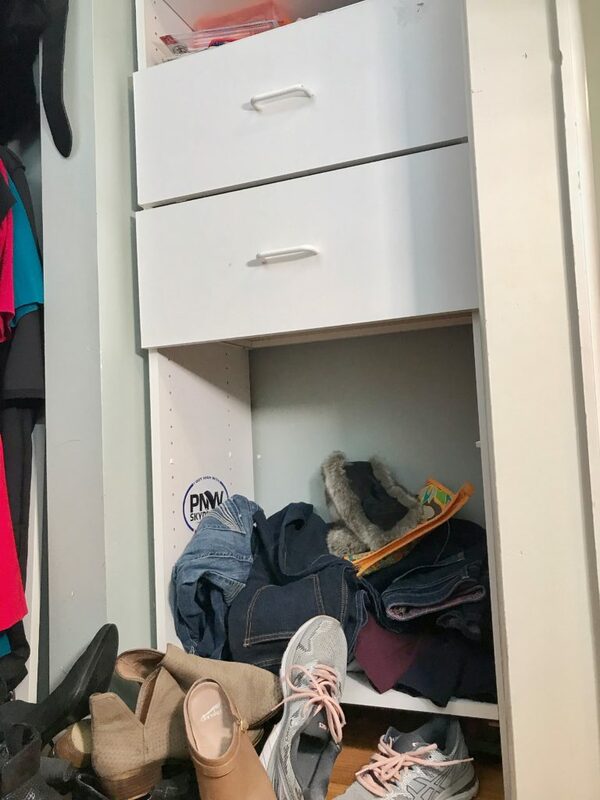 Chances are: crumpled and forgotten items stuffed in your closet aren’t that important to you, so begin your closet sorting process ready to prune! Outerwear – Boots, Shoes, & Coats…. Once the laundry baskets began to fill up with Steph’s shoes, I noticed she had a lot of large boots. Most were for outdoor, cold weather use. They were big and clunky and took up a lot of space, stashed among her pretty dresses. As I was removing items from her clothes bars, I also noticed some heavy winter coats. 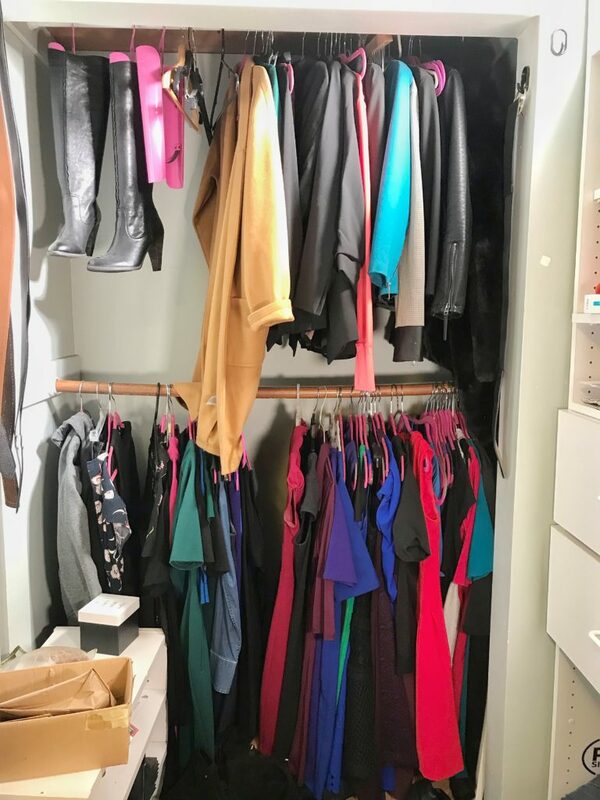 I asked to see her coat closet as a result. 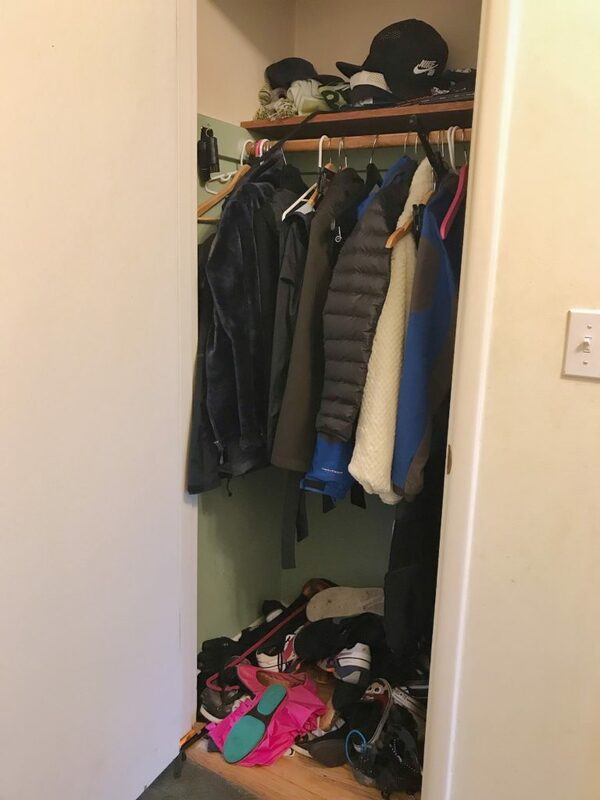 Steph laughed and showed me another family catch-all: the hall coat closet. 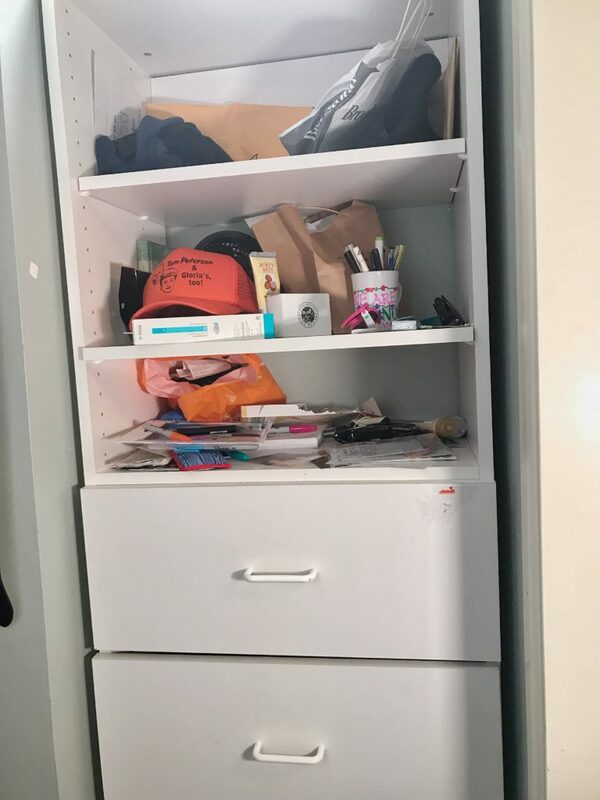 A traditional pole-and-shelf basic reach-in closet, the space was heavily used but not organized. The shelf and the floor held mish-mashed items and both required digging. 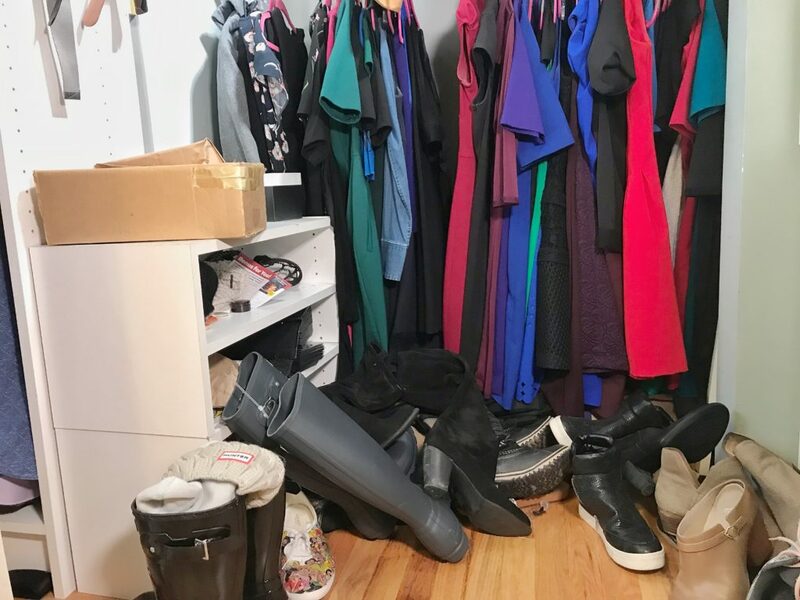 I could feel it coming: Steph was going to get a two-for-one closet overhaul!! 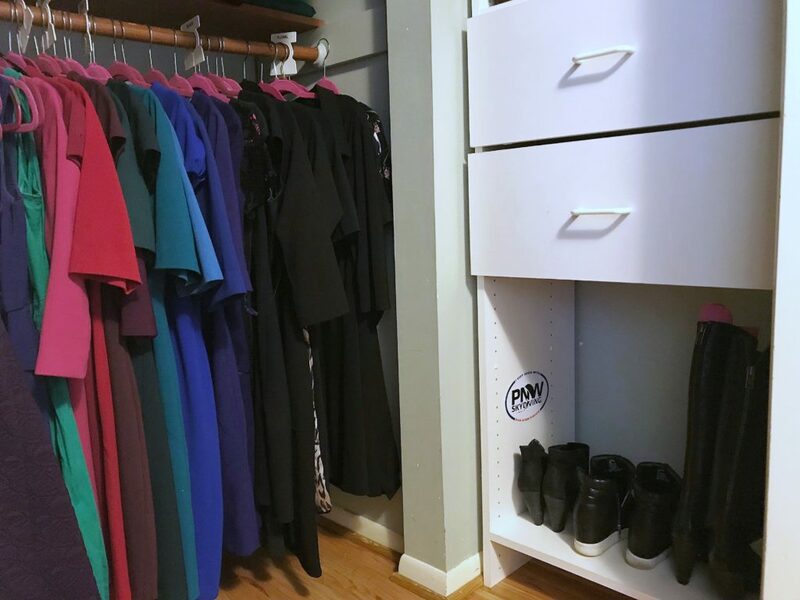 Done right, a master closet organizing project may result in related closets being amended or even created. 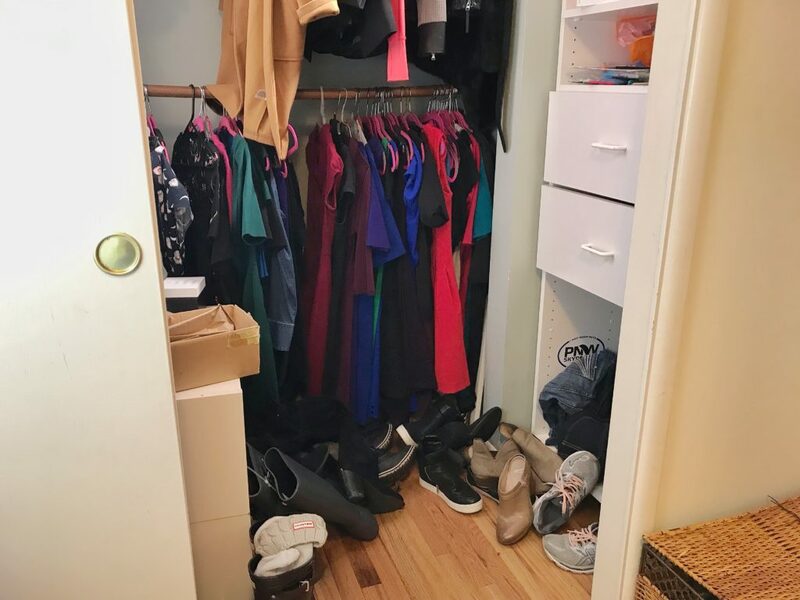 Once we cleared out Steph’s master closet, I removed a small shoe rack off the floor, because it wasn’t the right height and was hard to see into. We emptied the hall closet floor contents, swept it out, and re-homed the small shoe rack. 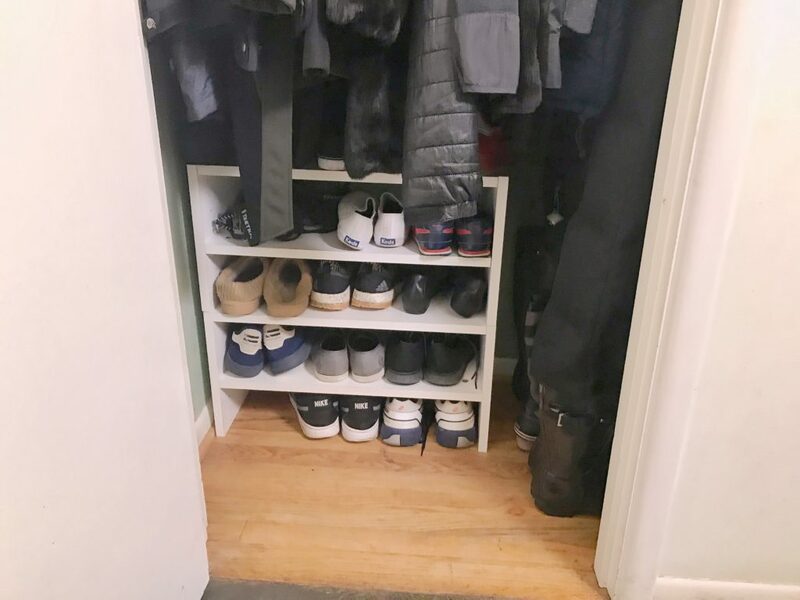 It was the perfect application for this smaller closet; I positioned it to face outward and loaded shoes by family member. We then purchased a few clear bins to sit atop the single shelf and I labeled them for: gloves, scarves, and ballcaps. Now family members could still “toss” items onto the shelf but this time into organized bins! 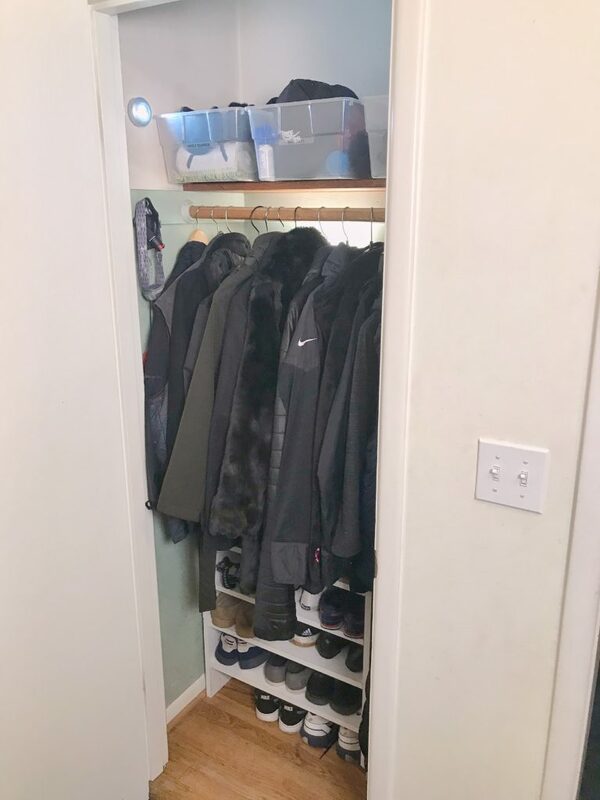 Removing outerwear like heavy boots, coats, scarves, and gloves from your everyday clothes closets and establishing an outerwear closet elsewhere is a great way to free up closet space and create distinction between storage areas. Mentioned above, I appropriated the small shoe rack that had been a clutter-collector on Steph’s closet floor for use in her hall closet. Once we got the space emptied, I stood back and evaluated this cabinet. I liked the visibility it offered. 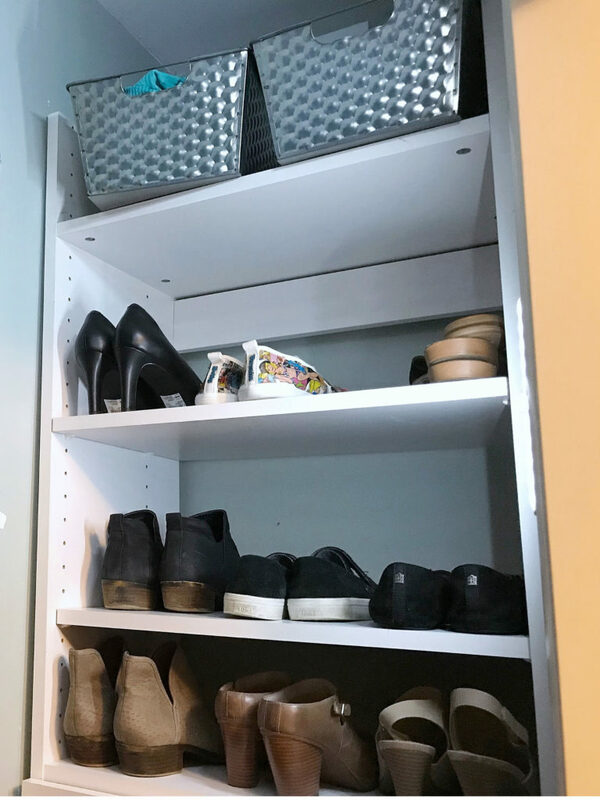 So, I decided this would become Steph’s “shoe bar.” Now that the shelves were cleared out, we could reload her everyday shoes and fashion boots onto this shelving unit. A key phase in the organizing process is evaluating the infrastructure of your storage space. Take a good look at the shelves, bars, and drawers. Assign a single purpose to each zone and this will simplify how and where you store each type of item. A key phase in the organizing process is evaluating the infrastructure of your storage space. We also had to remedy the black hole effect. We chose an affordable solution of small motion-activated easy mount lights. We added three of these lights to Steph’s closet to provide at least some dim lighting upon entering the space. This allows her to grab her outfit each morning and go without flipping on a blinding light and waking her husband. This also avoided calling an electrician for costly in-ceiling install. With a little attention to closet infrastructure like lighting and shelving, you can make affordable tweaks that drastically improve your space! I hope you’ve been inspired to corral your own closet clutter with this makeover. 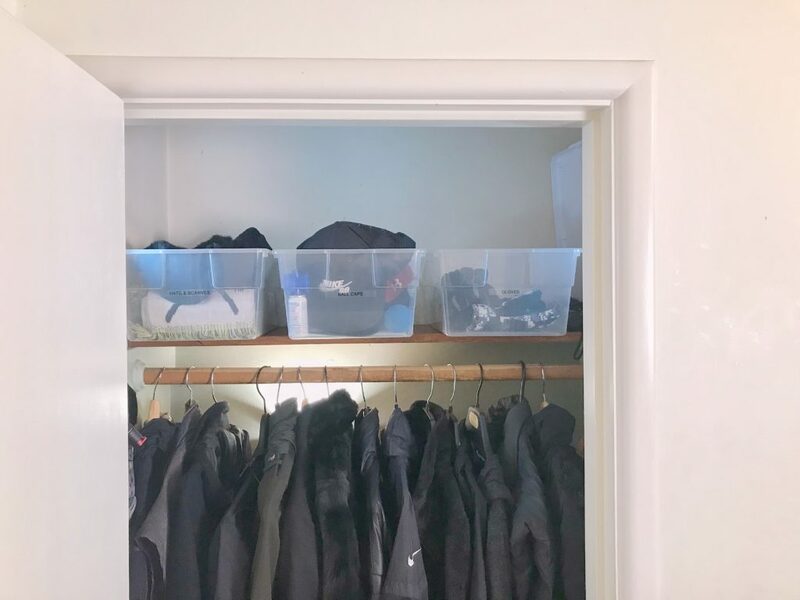 Be sure to check out our training Clothes Closet Organization for a step-by-step video tutorial!